Old Wings - Fairchild C-123T Provider - The "Turbo Provider"
C-123T Provider - The "Turbo Provider"
October 1980: Mancro Aircraft's C-123T Provider 64357, equipped with Allison T56-A-7 turbines and wearing Royal Thai Air Force markings. During the late 1970's, the Royal Thai Air Force operated a large fleet of about 40 Fairchild C-123 Providers (42 were originally delivered from USAF surplus between 1964 and 1976). 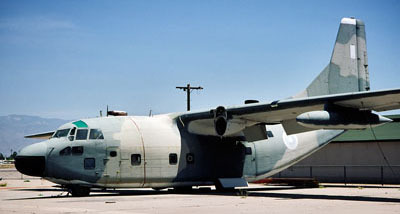 In 1979, in an attempt to extend the service life of this impressive fleet, the Thai government placed a USAF-supported contract with the Mancro Aircraft Company of Paramount, CA and Dallas, TX to acquire a C-123 from the USAF stocks at MASDC (Davis-Monthan AFB, AZ) and re-engine it with turbine engines. The aircraft purchased by the Mancro Aircraft Company was C-123B 56-4357 (msn 20241). This particular Provider was initially delivered to the USAF but almost immediately transferred to the US Coast Guard on 29 October 1958. It carried serial '4357' and was redesignated as HC-123B to indicate its Search and Rescue role. After almost 14 years with the Coast Guard, it was returned to the USAF on 22 May 1972, where it was assigned to 457th TFS (AFRes) and carried unit code 'TH' on the fin. Only three years later, on 20 June 1975, it was withdrawn from use and placed in MASDC storage at Davis-Monthan AFB, AZ, where it received inventory code CP036. C-123T Provider 64357 seen parked next to a USAF C-130 Hercules. With the Provider having been re-engined, both aircraft are now powered by the same engines, Allison T56 turboprops. After spending four years in the desert, this Provider was sold to Mancro and departed MASDC on 01 June 1979. Conversion work was started at Compton/Woodley Airport in California, close to Mancro's facility in Paramount. Several improvements to the aircraft were made, the most important of which was the replacement of the old R-2800-99W piston radials with new Allison T56-A-7 turbines. But the revised nacelles for these new engines made it impossible to retain the C-123's original fuel system. They then decided to seal the wings, so that these could be used as fuel tanks (wet wings). The newly converted C-123T Provider (unofficially dubbed "Turbo Provider") first flew from Compton/Woodley Airport on 24 October 1980, still in USAF camo, but now with Royal Thai Air Force markings. The tests revealed that more work needed to be done. Hydraulic pressure was needed for the control surfaces, which required the installation of an Auxiliary Power Unit (APU). Also, a heating system had to be to be installed for de-icing and for heating the cargo hold. These and other improvements made the project more complicated and expensive than originally anticipated. The Thai government now considered the Lockheed C-130H Hercules, three of which had been acquired the year before, to be a better alternative. They withdrew from the C-123T project in early 1981. The Mancro Aircraft Company then tried to find other interested parties for their C-123T conversion program. But they did not succeed, and the project was abandoned later that same year. The world's only C-123T Provider was robbed of its new engines and placed in storage at Tucson, AZ. C-123T 64357 in storage at Tucson, AZ, still basically complete and in good condition. Photo taken on 31 May 1990 by Aad van der Voet. Click on the photo for a larger image. Following that, nothing much happened to the aircraft for many years. Seven years later, on 22 August 1988, I noted it still in storage on Hamilton Aviation's ramp at Tucson, AZ. Except for the missing engines, the aircraft was still complete and basically in good condition. Although the hot Arizona sun had done a good job in fading the paintjob, the Thai Air Force roundel was still clearly visible. I noted the aircraft again during a visit to Tucson on 31 May 1990, in exactly the same condition. The first signs of change came on 03 August 1995, when the C-123T was registered with the FAA as a candidate for the US Civil Aircraft Register, with a subsequent change of ownership to Turboconversions Inc. on 13 December 1995. On 17 December 1998, the C-123T Provider was registered to H & R Corporation of Tucson, AZ as N6828, a registration which had been held by an American Airlines Boeing 727 until 1994. But still there appeared to be no change in the aircraft's status, and during a visit to Tucson on 20 March 2000, the C-123T was still withering away on the hot apron, where it had now been parked for 19 consecutive years. During the late 1990's a company named Provider Aviation Services Inc. from Chesterfield, MO, developed plans to restart the C-123T project, this time with a choice of the Allison T56-A-7 or the improved T56-A-15 engines. Initial restoration work on the airframe, which had been inactive and unprotected for far too many years, was to be done by Flight Test Associates of Tucson, AZ. The aircraft was moved to their hangar in late March 2000, with the actual restoration work starting a month later. Initial flight tests of the new C-123T Provider were planned for Fall 2004. Two years into the project, on 19 August 2002, the Provider was officially registered to Provider Aviation Services Inc., still as N6828. It is currently (February 2007) still registered as such. The second turbine conversion attempt did not turn out very well for C-123T 64357. It is seen here, still in storage at Tucson, AZ, but now with many parts removed. Photo taken by David Marshall on 03 October 2006. Click on the photo for a larger image. However, by 2004 this new project appeared to also have been abandoned. No further activity around the aircraft was noted, and no further updates were done to the company's website. The flight tests, scheduled for Autumn 2004, never took place. 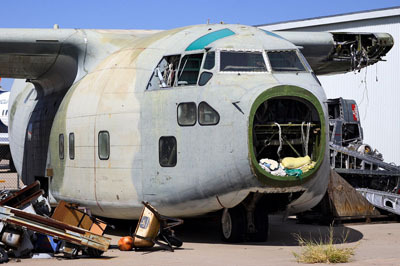 The C-123T was again placed in storage at Tucson, first seen as such in July 2004, hidden between two hangars near the Hamilton Aviation ramp. It was noted again at Tuscon in unchanged position and condition in March 2007. Although not much work had been done on the aircraft, its condition had changed for the worse. It is still engineless, but its outer wings and all tail surfaces have now also been removed, as well as many smaller parts. This includes the radome and several cockpit window panels, allowing the elements to easily penetrate the aircraft. Given its current condition, it appears to be very unlikely that this aircraft will ever fly again. Although having been registered as N6828 for many years now, the C-123T Provider is believed to never have carried this registration. And although Mancro Aircraft Company still holds the C-123B and C-123K Type Certificate today, they do not appear to have been involved in these latest attempts to breath new life into the idea of a Turbo Provider. My thanks go to Steve Darke of Thai-aviation.net and to Graham Robson for their kind help, and to David Marshall for his permission to use his photo of the C-123T Provider at Tucson in 2006. Thanks also to Ernie Szelepcsenyi, who emailed me in March 2010 that he had just seen the aircraft while vacationing in Arizona. It was still at Tucson, and still in the same condition as in David Marshall's photo.